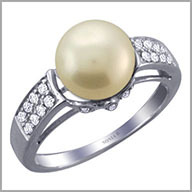 4k white gold, pearl and diamonds ring. Add red-carpet style to your look day or night! A brilliant accent for your office attire or evening gown, this ring is crafted with polished 14K white gold and glows with one round shaped 8-1/2mm akoya pearl in a secure adhesive setting. It features 22 round full cut diamonds in beads settings, total diamond weight is 0.2200 G-H in color and SI in clarity. This ring has a setting size of 3/8"L x 3/4"W and a height of 7/16".